My daughter’s Incas result in General Maths went down by 11months. Classmates went down by 30months! There are only 2 out of 4 assessment figures shown in the General Maths module and yet Incas has still given an overall age score! How? My daughter is in P7. I am supposed to use this garbage to assist in my choice of post-primary school! 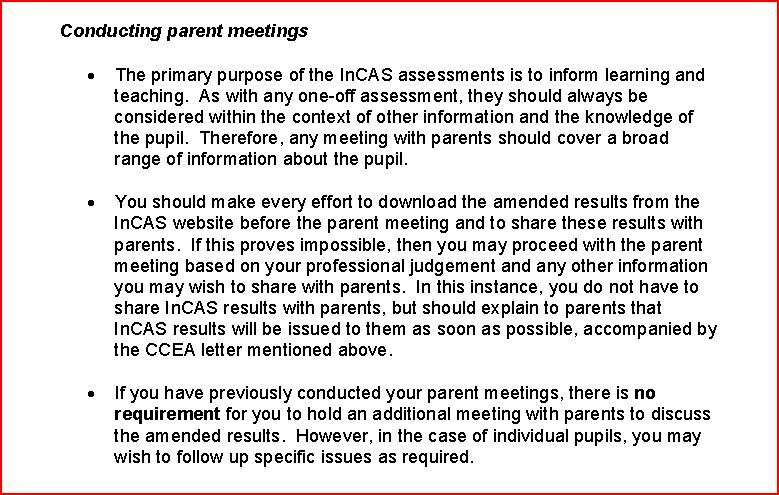 Any educationalist or politician that recommends the continued use of Incas needs hounding out of office! Any suggestion that continuous assessment is undertaken by using ‘computer adaptive software’ needs to be strongly challenged given the total fiasco involving Incas & CCEA. The fact is our children are not getting the best, as the statistics show the high number of children leaving primary education without the basic numeracy and literacy skills required!! The schools can not be blamed for everything but in the case of computer testing I think it needs to be abolished, with immediate effect, time bars can put any one off and the topics are not always and indeed in many cases what the child/ren havevnt even learnt? Bring it back to basics, save electric and lets get the 3 r’s.